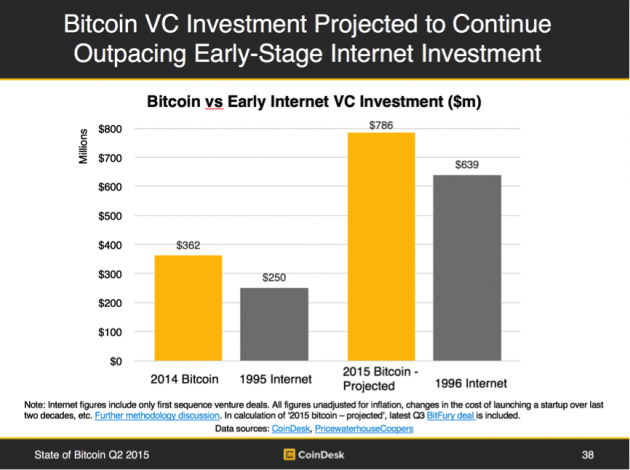 CoinDesk’s latest State of Bitcoin report is now live, focusing on events in the cryptocurrency world in the second quarter of 2015. This article runs through some key findings from the nearly 100 new slides found in the report. 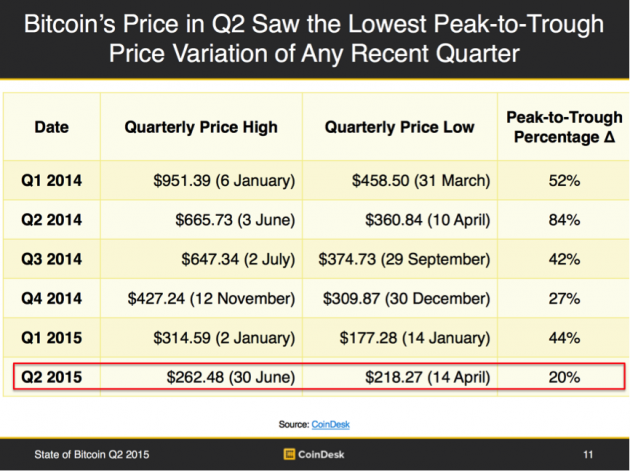 The Q2 2015 State of Bitcoin report marks the seventh report in CoinDesk’s series. During its creation, we reflected on how much has changed since the first State of Bitcoin was released in February 2014, enough that we felt it worth revisiting the report’s title. In short, why should this publication still be called the ‘State of Bitcoin’? From the very beginning, the State of Bitcoin included data on altcoins and other non-bitcoin subject matter (eg the Ripple protocol). However, when this publication was originally conceived we chose a title with ‘Bitcoin’ rather than a more general title (eg ‘State of Cryptocurrency’) given the overall dominance of bitcoin as reflected in measures such as bitcoin’s share of the total market capitalization for all cryptocurrencies, mindshare and media coverage, developer focus and other factors. Fast-forward 17 months and many significant industry developments that are not specific to bitcoin have now taken place, including progress made by various altchains and the advent of ‘private blockchains’. 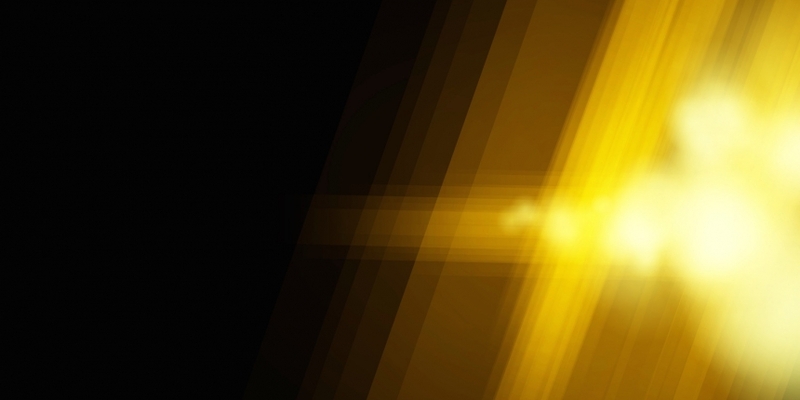 However, as revealed throughout the Q2 2015 report, bitcoin and its blockchain remain the ‘big enchilada’, leaving the ‘State of Bitcoin’ an appropriate title for our analysis of the most important trends and developments in the overall cryptocurrency industry. 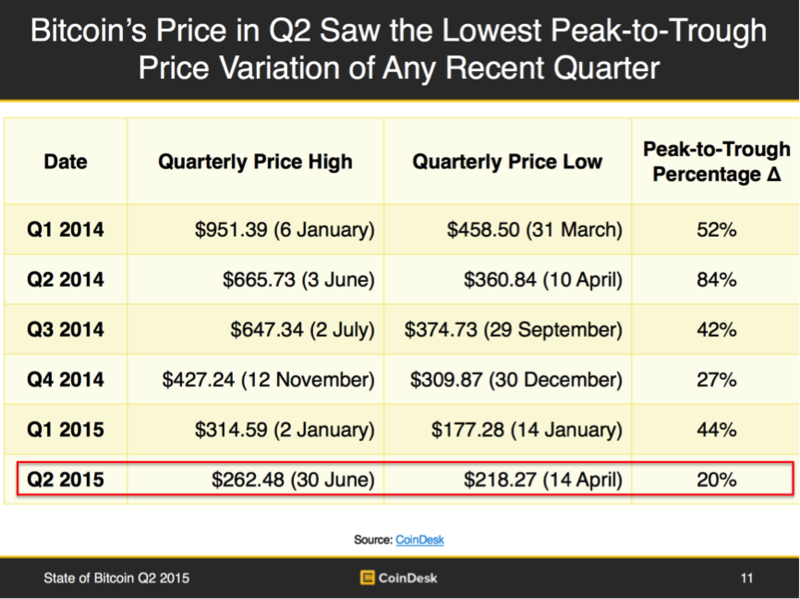 Top-of-mind for Q2 is the renewed life seen in bitcoin’s price in the past few weeks. 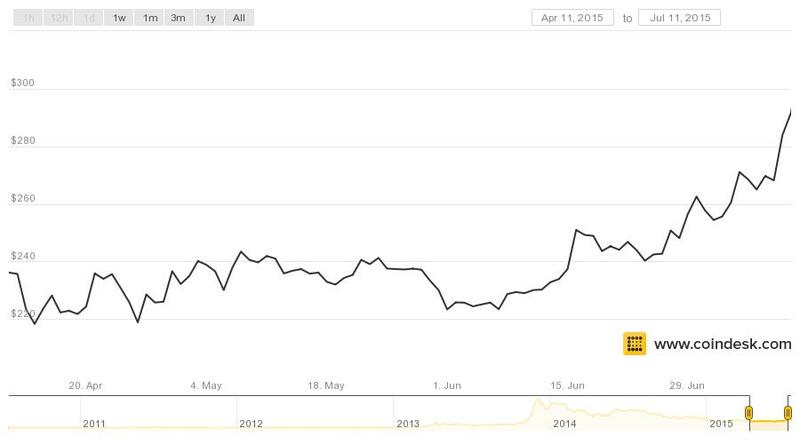 The bitcoin price, on a quarterly return basis, had been on a 12-month losing streak prior to the end of June (Chart 1). Much of the speculation behind why bitcoin’s price appreciated 8% in Q2 (with gains coming in the quarter’s final days), and a further 5% in Q3 (Chart 2), has focused on the macroeconomic and financial issues in Greece and China. Our assessment is that there is merit to this view, with a couple of important caveats. With regard to Greece, it is true that several measures of sentiment suggest the country has a growing interest in bitcoin. However, for a number of reasons we believe it is observers of the Greek crisis, rather than the Greeks themselves, that are likely to be responsible for any price appreciation associated with Greece’s debt crisis (Slide 84). In contrast, the significant gaps in exchange rates on Chinese exchanges and those outside the country suggest the Chinese were driving bitcoin’s price appreciation following concerns over financial market stability and trading restrictions. 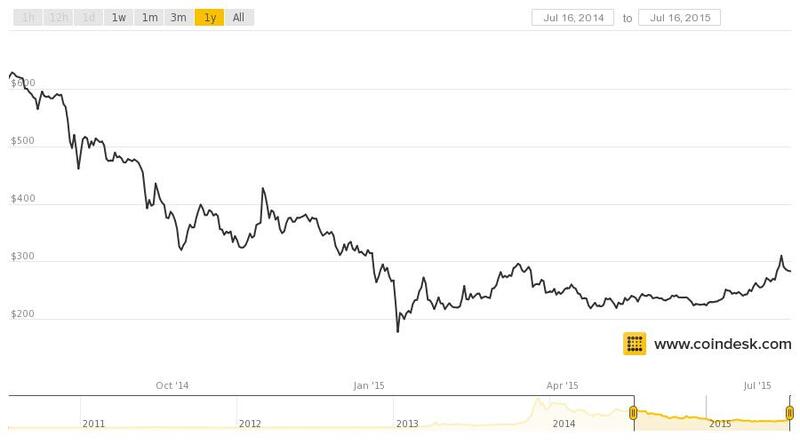 While the Chinese government crackdown on sellers appears to have slowed the stock market free-fall, further financial market instability (forecasted by China-watchers like Michael Pettis and others) may lead to Chinese buyers piling back into bitcoin. Bitcoin market watchers will recall that Chinese buying was an important driver during bitcoin’s 5x price spike in November 2013. Even with bitcoin’s end-of-June price rally, the second quarter was one of the least volatile in recent history (Slide 11). Whether lower price volatility represent progress, poses problems, or is a combination of both is a subject of considerable debate. 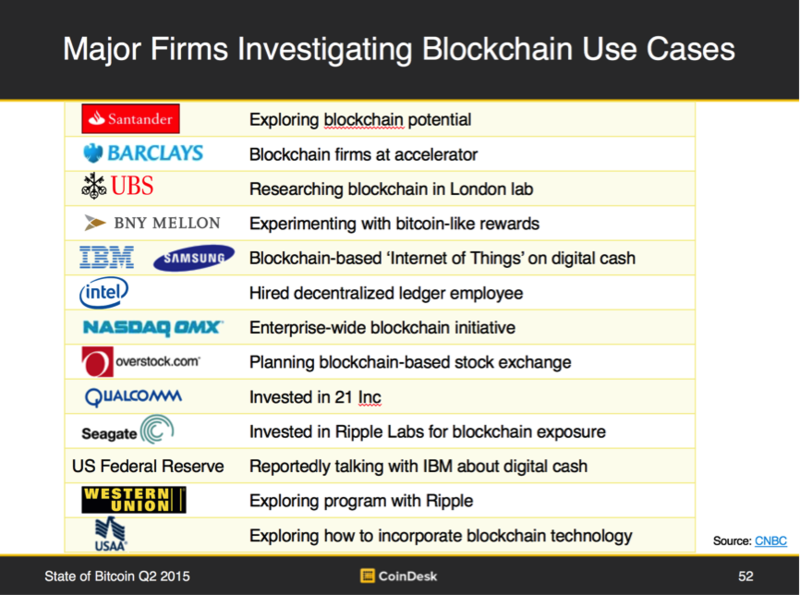 While many large financial institutions have been examining bitcoin and related technologies for some time, Q2 was the quarter that many came public with announcements of various trials and investments in blockchain technology and related companies (Slide 52). One notable example was the announcement by NASDAQ of a blockchain-based solution for managing privately traded shares, which were previously transferred through a cumbersome manual process. While the word ‘bitcoin’ was conspicuously absent from NASDAQ’s public announcement, it is in fact bitcoin’s blockchain that NASDAQ is utilizing. In addition, seven banks from around the world have now established partnerships with Ripple, including three of Australia’s ‘big four’ banks (Slide 34). The increasing attention shown in blockchain technology by traditional financial services firms is being driven by an awareness of the potential to reduce costs, improve product offerings, and increase speed, as highlighted in a recent report from the Euro Banking Association (EBA). 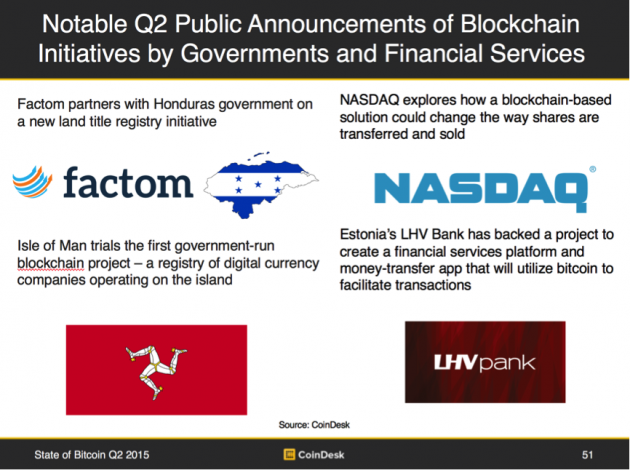 There were also two significant government blockchain announcements this quarter. The Isle of Man is running the first government-run blockchain project, creating a registry of digital currency companies operating on the island. Also, the government of Honduras has purportedly partnered with decentralized record-keeping startup Factom on a new land title registry initiative (Slide 51). Overall, Q2 heralded the arrival of the blockchain, and its utility as a technology platform, as it stepped out from the shadow of bitcoin the currency. Total bitcoin venture capital increased 21% to $832m in Q2, with the quarter’s two biggest deals by Circle and Ripple of $50m and $28m, respectively. We continue to project 2015 bitcoin venture investment to surpass early stage internet investment in 1996 (Slide 38). However, rising competition in the bitcoin ecosystem has led to an increasing number of acquisitions and bankruptcies, with consolidation particularly active in exchange and mining sectors due to cost and competitive pressures (Slide 32). Further, the closure of bitcoin startup Buttercoin, which counted deep-pocketed Google as one of its investors, served as a wakeup call that the venture capital spigot, which has buoyed the industry of late, can be turned off as well as on. The rate of growth in the number of new bitcoin-accepting merchants remains below previous quarters (Slide 57). Given these trends, will bitcoin be confined to remain a store of value with no future as a widely used medium of exchange? Not necessarily. One reason people don’t use bitcoin as a medium of exchange is because very few are actually paid in bitcoin. But this may be about to change. 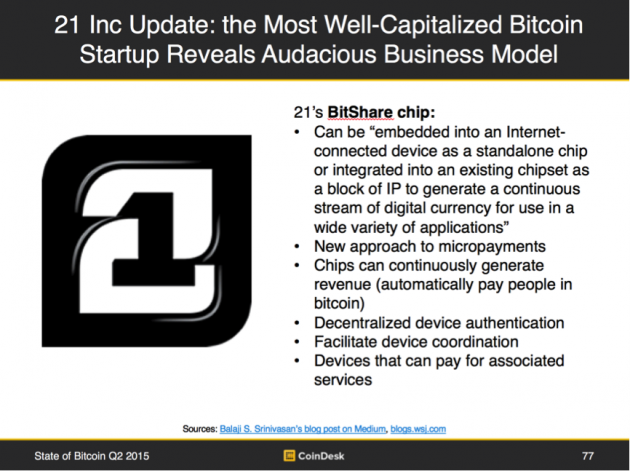 In Q2 the most well capitalized bitcoin startup, 21 Inc, revealed its plans around its BitShare mining chip, which will be integrated into a wide variety of consumer devices (Slide 77). What makes the BitShare chip and similar efforts so interesting from a medium of exchange perspective is their ability, in the words of 21 Inc CEO Balaji Srinivasan, to “generate a continuous stream of digital currency for use in a wide variety of applications”. In other words, after a device with an embedded mining chip is acquired, the user will be automatically and regularly paid in bitcoin, just as many people have their wages directly deposited every two weeks into their bank accounts. Overall, there are many open questions about embedded mining chips, and even if the technology and economics are sound, it may take a considerable amount of time for such devices to gain significant adoption. However, should the use of embedded mining chip devices become widespread then it could be a game changer for bitcoin’s prospects as a medium of exchange. 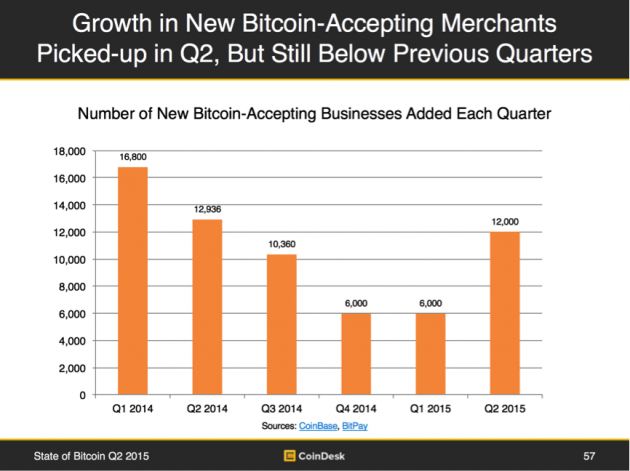 We hope you find the Q2 2015 State of Bitcoin report useful, we welcome your feedback and ideas for our future reports. 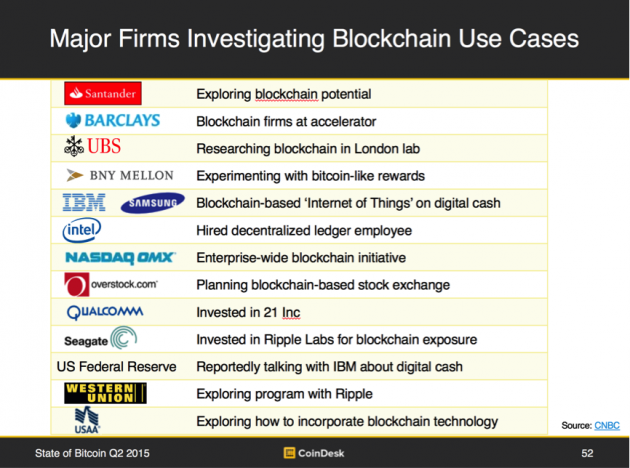 To view more of CoinDesk’s Research Reports click here.